San Bernardino County Supervisor James Ramos was chosen by 57.87 percent of voters last Tuesday to represent District 40 in the California State Assembly. Ramos beat his opponent, San Bernardino City Councilman Henry Nickel, by double digits to fill a seat vacated by former Assemblyman Marc Steinorth of Rancho Cucamonga. Steinorth left the Assembly earlier this year when he attempted and failed to unseat San Bernardino County Second District Supervisor Janice Rutherford, he subsequently ran for a seat on the Rancho Cucamonga City Council. Where he currently holds a razor-thin lead over his nearest opponent. With Ramos’ election to the State Assembly, he will leave a seat on the San Bernardino County Board of Supervisors he has held since 2012. During his tenure he also served as Chairman of the Board from 2015 to 2017. Throughout his time in this position, Ramos remained focused on issues of importance to the Third District—the area he represented—and the county at large. Born and raised on the San Manuel Indian Reservation, Ramos grew up in a mobile home in one of the most poverty-stricken areas of San Bernardino County. He developed a strong work ethic in his youth and eventually became a successful entrepreneur owning two restaurants in the San Bernardino region. Ramos and his wife Terri have been married for 28 years and are the proud parents of four children. As a politician, Ramos continues to set precedent. 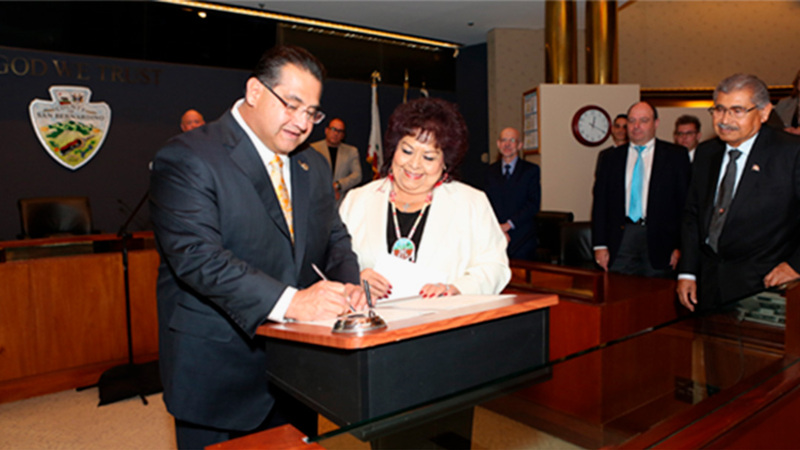 He was the first Native American elected to the San Bernardino County Board of Supervisors, the first Native American to serve on the San Bernardino Community Board of Trustees and he will now serve as the first California-born Native American elected to the California State Assembly.